I bet most of you are pleased that the election season is over. Well, OK, mostly over. Some races have been too close to call at this point on Wednesday morning. Votes are still being tallied for these candidates. But for the most part, the General Election is now in the past. Some of you are probably very excited about the results last night. Others of you may be disappointed. Many of us will move on with our normal, everyday routine. Some will be wondering if things will ever go back to normal for them. What do we do next? What if the people we voted for didn’t win? What if the candidates we didn’t want are now in high positions of authority in our local, state, and national government? What if the people we did vote for made it into office? What can we do next for any and all our government officials? Well, I’ll tell you. The answer is pretty simple. That’s right. Pray for your government officials. Whether you voted for them or not. Some of you might not agree with this tactic. It sounds too simple or in your mind, it doesn’t sound like the right thing to do. But, what if I told you it’s what God wants us to do? Pretty straightforward, right? Pray on behalf of your leaders, bring their requests and needs before the Throne of Grace, and even offer prayers of thanksgiving for them! Even for the people, we didn’t vote for? Yes, especially for the people we didn’t vote for! Why is this so important? Why pray for our leaders and even those we didn’t vote for? So that we, you and I, may live peaceful and quiet lives. So that you and I can strive toward godliness and be dignified. So that what God would see in both our politicians and in ourselves that which is good and pleasing in His sight. It is good for us to pray for our leaders. It actually does us good! 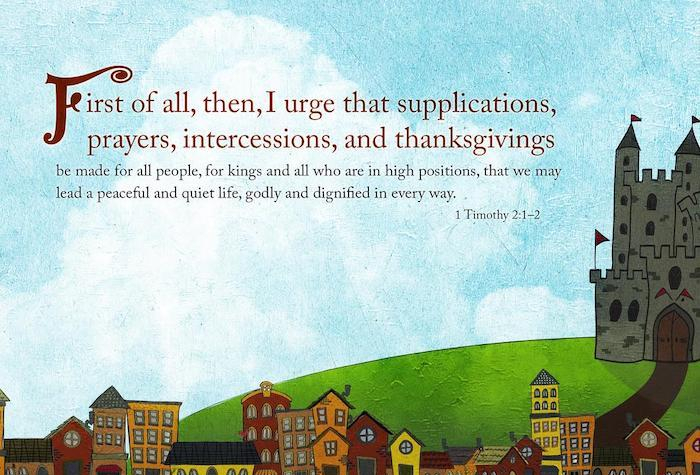 Praying for our leaders actually leads to us being able to live quiet and peaceful lives! Doesn’t that sound great?!? Praying for your leaders don’t require much effort. Even if you don’t like the person you pray for it wouldn’t take more than 5 minutes to stop to pray for them. Pray that they obtain wisdom and use it in all their decisions. Pray that they serve their constituents well. Pray that they have time for their families. Pray that they come to the knowledge of the truth about Jesus Christ. Just Pray. The elections might not have turned out the way you hoped. Or maybe they did. Whatever the results, devote time in your week to pray for your leaders. It’s for their good and for your good! Thinking maybe the mess we find ourselves in as a country is because God’s children haven’t been praying enough for our leaders. Good post. I agree that that is part of the problem! In my series Walking with Christ through the Bible, we have come to the book of Nehemiah, a praying governor. I’m hoping to look at his prayers and how we might use his example in praying for our nation. I hope you enjoy Jon’s post from Nov. 6th as an introduction to Nehemiah the praying Governor. You might also check out his other posts on theologicaljon.com. Jon, I reblogged this post today as an introduction to the book of Nehemiah. It fits well with where my thoughts are going for this book in my series, Walking with Christ Through the Bible. Amen. God is in control, whether ‘our’ candidate made it or not.